Dell would hardly have been top of everybody's wish list when potential Windows Phone 7 handset manufacturers were first touted, but the oddly-named Venue Pro will nevertheless get a UK release date before Christmas. The handset is already being offered for pre order through Expansys for £439.99 and expect it to be available from Dell as well as a handset partner. The handset seen here (snatched directly from the claws of a Dell representative) has T-Mobile branding. The handset doesn't feel overweight, but it does feel extremely robust. The Dell Streak may be a more consumer-orientated handset (if you can call it a handset) but the Venue Pro has the demure look and feel of a business phone. It's about 15mm thick and measures around 120 x 65mm. The handset has the familiar Windows Phone 7 spec: 1GHz Qualcomm Snapdragon 8250 processor alongside a five-megapixel camera with digital zoom, geotagging and touch-focus and 800 x 480 4.1-inch OLED touchscreen. As you may be able to see from our hasty pics, the screen has a rather odd curvature to it. It certainly makes the phone stand out from the crowd. There's a slide-out QWERTY keyboard and, though it seemed responsive, we weren't thoroughly impressed by it – we'll reserve judgement on this until our full review, though. While phone keyboards are usually difficult to get used to, the fact remains you do get used to them eventually. 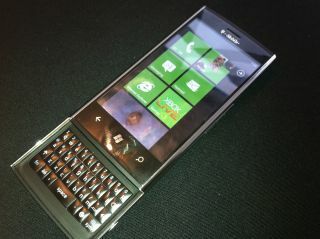 The rear of the device is characterised by a checkered finish, camera/flash, and the Windows Phone and stand-out Dell branding. There's also AGPS, accelerometer, digital compass and a proximity sensor.